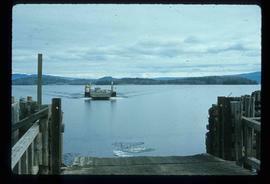 Image depicts a boat on Babine Lake, taken from Granisle, B.C. 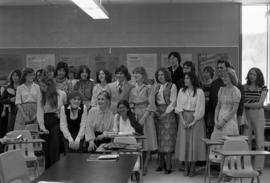 Photograph depicts a group portrait of the grade 12 French class at a Granisle school. 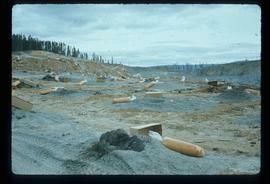 Image depicts numerous bags of blasting powder at a mine site somewhere in Granisle, B.C. 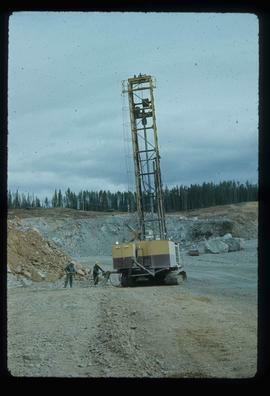 Image depicts a drill for blasting holes at a mine site somewhere in Granisle, B.C. 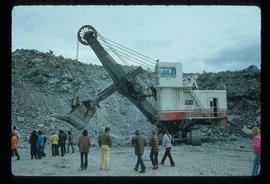 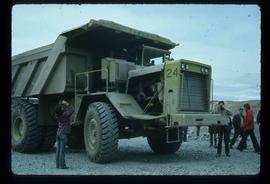 Image depicts a large, electric shovel at a mine site somewhere in Granisle, B.C. 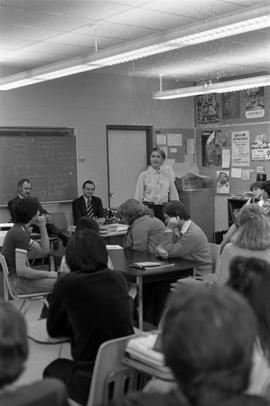 Photograph taken during one of Minister Iona Campagnolo's visits to high schools in the Skeena Riding.Handwritten annotation on verso reads: “Granisle”. 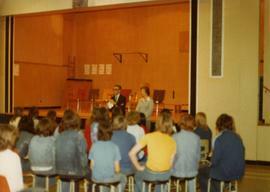 Photograph depicts Iona Campagnolo Iona Campagnolo sitting with students from Babine Elementary-Secondary School in Granisle during a school debate regarding killing baby seals. 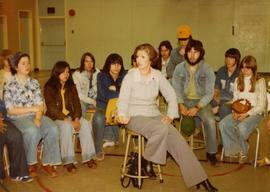 Photograph depicts Iona Campagnolo speaking to students at Babine Elementary-Secondary School in Granisle, BC. 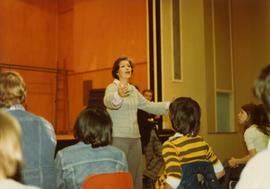 Photograph depicts Iona Campagnolo speaking to a group of students at a Granisle highschool. 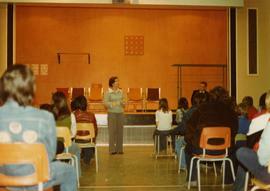 Photograph depicts Iona Campagnolo speaking to students from Babine Elementary-Secondary School in Granisle during a school debate regarding killing baby seals. 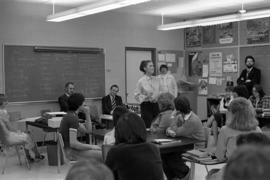 Photograph depicts Iona Campagnolo standing in front of students in Babine Elementary-Secondary School auditorium in Granisle during school debate regarding killing baby seals. 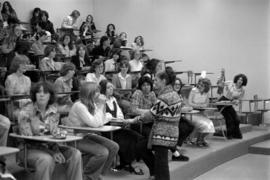 Photograph depicts Iona Campagnolo speaking with the grade 12 French class at a Granisle school. 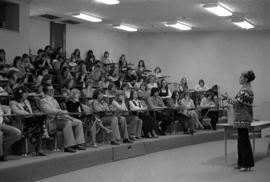 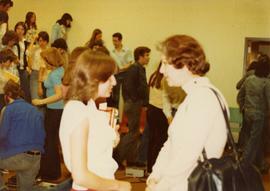 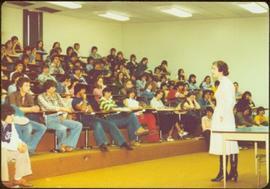 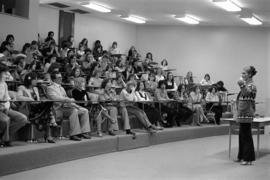 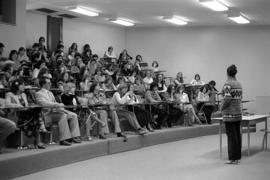 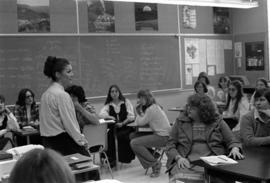 Photograph depicts Iona Campagnolo speaking with staff and students in the grade 12 French class at a Granisle school. 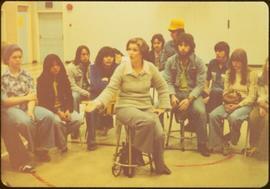 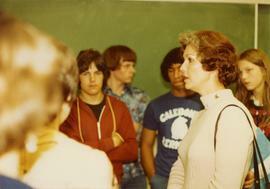 Photograph depicts Iona Campagnolo speaking with a group of students at a Granisle highschool. 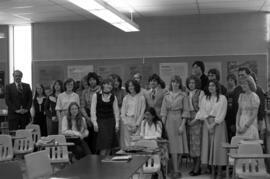 Photograph depicts a group portrait with Iona Campagnolo and the grade 12 French class at a Granisle school. 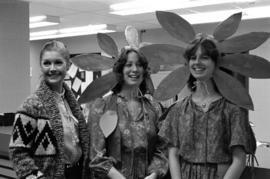 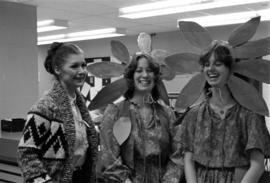 Photograph depicts Iona Campagnolo with two teenage girls dressed as daisies at a Granisle school. 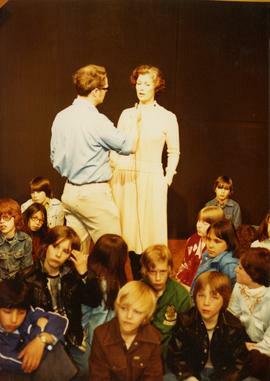 Handwritten annotation on verso reads: “Granisle School”.